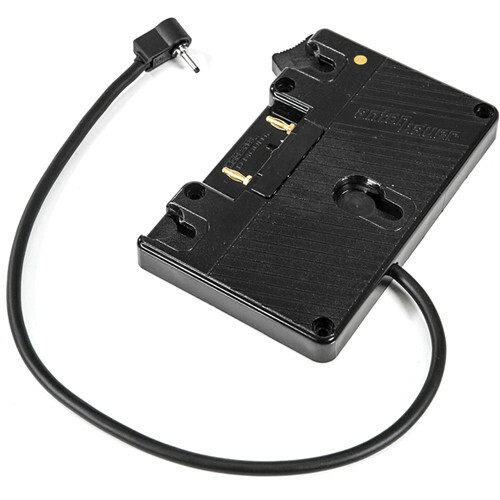 This Gold Mount Plate for Blackmagic Pocket Camera from Wooden Camera enables you to use longer-lasting Gold Mount batteries with your Blackmagic Pocket Camera. This plate connects to the camera using a 15" cable with a DC connector. The plate includes one D-Tap accessory port providing 12 to 16V for powering accessories. The Gold Mount Plate can be mounted several ways, including using Wooden Camera's Battery Slide mounting adapter (sold separately). Box Dimensions (LxWxH) 4.9 x 3.7 x 0.75"